Om Ganesh - Saikumar in different avthaar! Dailog King Saikumar's new film Om Ganesh was launched on April 3rd at Basavanagudi Doddaganapathi Temple. Many famous personalities of Kannada film industry were present in the function. Actor and politician Ambarish switched on the camera while R.V. 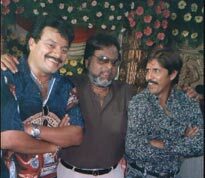 Devaraj clapped for the first shot of the film. Om Ganesh is the debut production of A. Mohan. Thriller Manju who entered the film industry as a stunt master is directing this film. For a change Manju is not acting in the film. After film Police Story once again Saikumar, Thriller Manju and J.G. Krishna are working together. This film is about a youth who is innocent but intelligent. Some important incidents of his life creates the story line. Hero Ganesh is a cable TV operator. He becomes a prime accuse in a bomb blast case. How he comes out of this problem is the core part of the film. Film troupe says Saikumar will use his brain power than his muscle power. Unusually, Saikumar is out of police uniform and even the film title is unique compared to that of his earlier ones. As Saikumar says "Om Ganesh is a typical commercial film with family sentiment, political drama, music, comedy, stunt etc" They want to address all type of audience from youngsters to entire family members. Though the story line looks similar to that of film AK 47, according to storywriter Daya, presentation and screenplay are completely different and unique. This is the third film for Daya while he wrote dialogues for film H2O and Hudugigagi. Heroine Swapna is from Telugu filmdom. After Bhagath, (against Thriller Manju) this is her second film in Kannada. Veteran actress Ambika plays the CM role. New entry Keerthana plays hero's sister role. C.R. Simha, B.V. Radha and Ashok are also acting here. Om Ganesh has five songs with Krupakar's music and K. Kalyan's lyrics. Sonu Nigam, Udith Naraya, Munikrishna, S.P. Balasubrahmanyam, Chitra are the singers. Song recording was started in March first week and shooting is scheduled for 45 days and will be shot arround Bangalore. Song sequences will be shot in Kushal Nagar and Chikkamangalore.